I found these Three Earthen Clay Vessels lying on the ground in front of Albert Hall Museum, Jaipur. One finds a lot of pigeons on the ground there. Visitors to the museum, generally buy food from the pigeon food sellers and feed the birds. 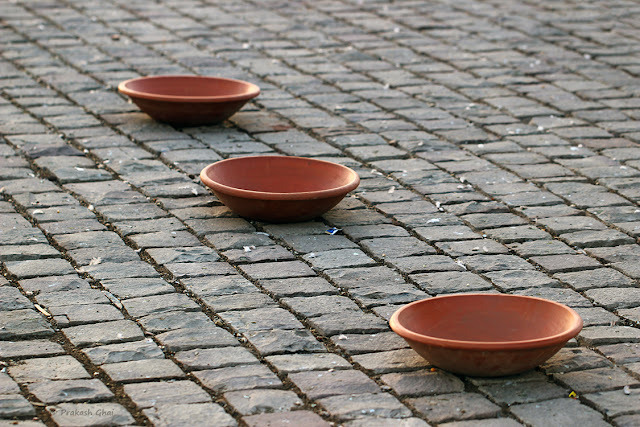 These empty clay vessels were kept for the birds to drink water from. But, because of the Summer Heat, all the drinking water for the birds dried up. ... And they forgot to refill it. Maybe the food sellers were too busy making the money. Prakash, your minimalism photos are soothing. They are not only B&W as they labeled Minimalism with.